USAID/WA organized for the staff of the West and Central African Council for Agricultural Research and Development CORAF / WECARD, on Thursday May 11thin Dakar, SENEGAL a training on the steps to properly close USAID funded projects. USAID’s team of trainers consisted of George APPIAH, Financial Analyst and Abigail AWASEY DUNYO, Financial Analyst Supervisor, all based in Accra, Ghana. 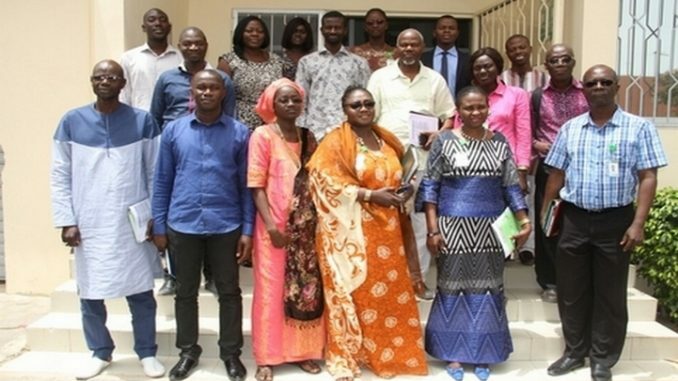 CORAF / WECARD staff led by Mrs.Safouratou A. ADARIPARE, Administrative and Financial Director,DrErnest ASIEDU, Chief of Party of the West Africa Seed Program WASP / PSAO, funded by USAID and Several chief accountants of the institution. The training was built on two sessions. The firstpresented by Abigail AWASEY DUNYO, Financial Analyst Supervisor. Mrs. AWASEY DUNYO described the global approach of the “Close-out”, its objectives, critical steps and the essential documents required. The second session by George APPIAH, Financial Analystfocused on the “SF 425” (Standard Form). The SF425 sheet is a unique document containing all the essential information’s to achieve a successful close out. The three (3) parts of the sheet were presented and discussed with the entire CORAF team participating at the training. The two USAID agents insisted on the timelineto convey all the required documents, some three months from the end of the life of the project. They explained the approach on howto manage the project staff and the equipment’s. They also mentioned to accountants that “spending’s” beyond the official date of closure of the project wouldn’t be reimbursed by USAID”. It should be noted that WASP funded by USAID/WA is ending July 31st 2017 after a five-years (2012-2017) ends on 31 July.